Frame-able area is 5" x 7", artwork is on 6" x 9" heavyweight paper, french materials, with linen finish. 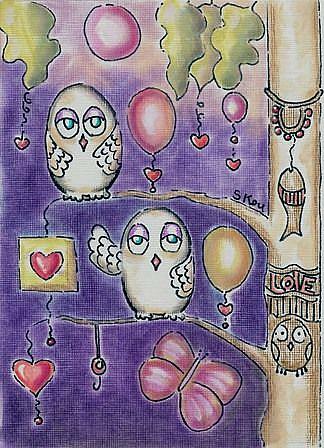 Owls, hearts, balloons, and a butterfly. Done in acrylics, and pastels with four coats of finish for protection. Frame-able area 5" x 7"